After I left Farnham College, I went to Salford University for a four year degree course in Applied Chemistry. This was a sandwich course during which I worked in London (The Tropical Products Institute), Belgium (Colgate Palmolive) and France (CNRS). Having graduated, I started working, again in London, for Derwent, producers of the World Patent Index, which some of you scientists may have heard of. I spent several years reading chemical and pharmaceutical patents and turning them into database records. I joined the training 'team' of then just one person and trained Derwent's clients in search and retrieval techniques. I visited virtually every European country as well as the US and Brazil. During this time I bought a flat in SE London although with all the travel I didn't see much of it. In 1993 I changed tack slightly and went to work for one of the database host companies in a training/sales role for the UK market. I had to get to grips with other databases, not just scientific, but company information, financial data and newspapers too. During this time my road atlas became very well thumbed. Remember, this was pre-SatNav! I got married in 1998 to Clive and we bought a house in Walton-on-Thames, Surrey. At the end of 2000 our identical twin boys, Alexander and Jonathan, were born. They were a bit of a shock to the system. I gave up work at this point! The quick expansion of the household resulted in several house moves and we have now settled in Weybridge just a couple of miles from our first house. The boys started school and after a couple of years I decided to look for part-time work. I was very lucky to get a job in a school office very close to home, although initially I had to work full-time. I deal mostly with staff administration. Over the last six years I have scaled the work back to just four short days per week which is much better for me. The job is full-on though as it is in a school for children with severe learning difficulties and everyday is a challenge, even for us in the office! 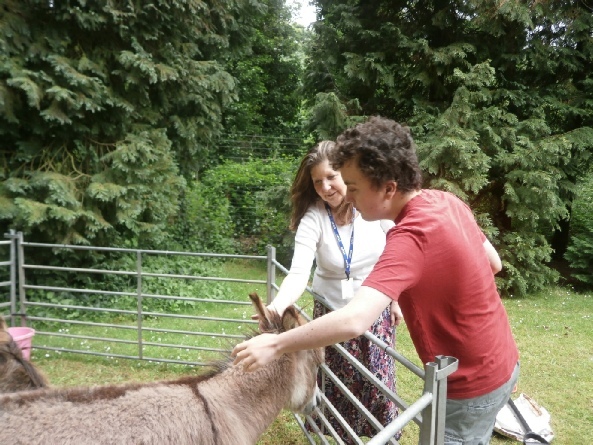 The photo shows a fairly typical day at work - meeting the animals brought in by a mobile farm for the students. Any spare time now is spent gardening ( I helped put together a garden for the Hampton Court Palace Flower Show a few years ago) and antiques hunting in local shops and fairs.